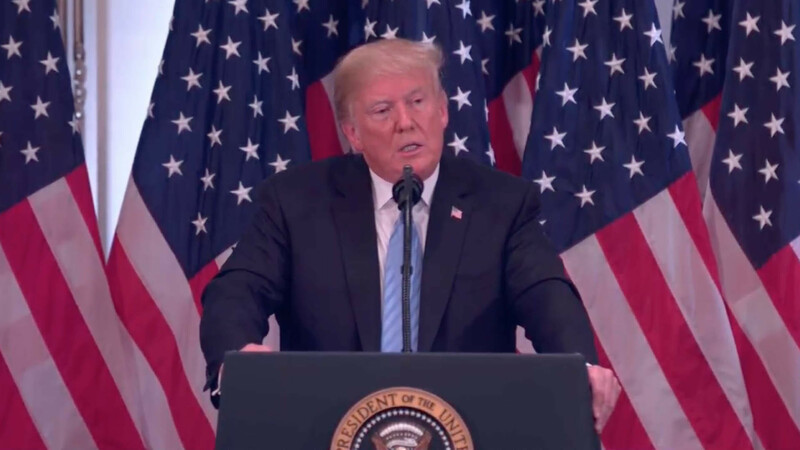 Following his speech at the United Nations General Debate on Tuesday, President Donald Trump was asked about his comments regarding Venezuela and the recent levying of new sanctions against members of President Nicholas Maduro’s government and family. “I just want to see Venezuela straightened out. I want the people to be safe. We’re going to take care of Venezuela. Okay? We’re going to take care of Venezuela. What’s happening in Venezuela is a disgrace. “I recently returned from South America, where I met with leaders in Brazil, Argentina, Chile and Colombia. And I’m reminded that, despite the problems we admittedly face here in our hemisphere, we are fortunate to see increasingly an island of democratic stability and growing prosperity in an unstable world, from Ottawa to Santiago and Buenos Aires. “There are exceptions, and we know them: Venezuela, Cuba, Nicaragua. Even Castro knows now that the Cuban model doesn’t work even for Cuba any more, or for anyone else, as Venezuela’s Maduro is finding out. “Every option — and you know what I mean by “strong.” Every option is on the table, with respect to Venezuela. Those comments closely follow a report published by Axios that detailed a “roadmap” for military intervention in Venezuela. The document featured a draft of a “step-by-step program of escalation” that was reportedly followed by the administration following the president’s inauguration. All signs seem to be pointing toward military invention of some sort in Venezuela, either by the U.S. unilaterally with support from neighboring countries, or by a coalition of Latin American countries led by the U.S. How soon may be answered with the upcoming confirmation of incoming U.S. Southern Command commander Vice Adm. Craig Faller, which is coming up in the coming days. This entry was posted in Argentina, Brazil, Civil Unrest, Cuba, Donald Trump, Latin America, National Security & Terrorism, Politics, South America, USA and tagged Argentina, Axios, Brazil, Buenos Aires, Chile, Civil Unrest, Colombia, Cuba, Donald Trump, Doral, James Mattis, Latin America, Miami, National Security & Terrorism, National Security Council, Nicaragua, Nicolas Maduro, Ottawa, President: ‘We’re Going to Take Care of Venezuela’, Santiago, SOCOM, South America, U.S. Southern Command, United States, Untied Nations General Debate, Venezuela, Vice Adm. Craig Faller. Bookmark the permalink.